Bedknobs provides an ideal base whether travelling for business or pleasure. It's just 5 minutes walk from Bodmin town centre and close to the A30 with easy access to the whole of Cornwall. Open all year round, Bedknobs offers elegant, spacious and exceedingly comfortable en-suite accommodation. Its three guest bedrooms each have their own bathroom fully equipped with power shower and bath. A little bit of luxury B&B in Cornwall. Berry Lane Cottage is nestled in its own grounds of 6 acres of paddocks and woodland just outside the little village of Nanstallon. It is 5 minutes from the Camel Trail an 18 mile off road cycle path between Wenfordbridge and Padstow and 12 miles from the beaches of north and south Cornwall. br / br / br / br / We are happy for you to bring your well behaved dog and you are more than welcome to bring your hens and other small pets. Please be aware that we keep livestock so your dog must be under control at all times. br / br / br / br / High speed WiFi is available I the garden but not in the hut. br / br / Proper quality coffee real milk and home made cake and/or biscuits await you in the huts. They have comfy beds a Little radiator a small fridge wood stove and a kettle for making tea and coffee. A breakfast basket will be bought to your hut. A shared bathroom for both huts is a short walk away with hot shower and flush loo (or a compost toilet and gas powered hot shower is available for those who want the camping experience June-September only). br / br / br / br / We have extensive grounds and gardens for you to wander in and the sheep goats ducks and chickens will love to make your acquaintance! br / br / br / br / We cater for all diets and allergies so please let us know your requirements in advance. br / br / PLEASE NOTE HUTS ARE NOT SUITABLE FOR THOSE WITH SEVERE MOBILITY PROBLEMS NOR FOR TINY CHILDREN AS WOOD STOVES AND STEEP STEPS. Stay at Higher Lank Farm – a unique Cornish holiday experience, exclusively for families with babies and toddlers. 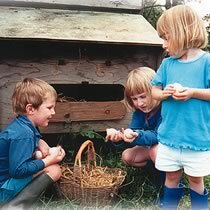 - Enjoy playing in wonderful farm themed playgrounds. Friendly, relaxing and welcoming...... Let them help your family have a fabulous time. As far as we are aware, they are unique in that they ONLY accept bookings from families with at least one child under 5. We do not know of anyone else who does what they do! Welcome to Mennabroom. Mennabroom is a small country estate with an historic farmhouse and three holiday cottages situated on the southern edge of Bodmin Moor in South East Cornwall. The farm offers award winning luxury bed and breakfast accommodation in the house and self catering in its three cottages. All are grade II listed and have been sympathetically restored tastefully combining 21st century with 13th to 17th century. br / br / br / br / The bed and breakfast accommodation offers two luxury super king sized/twin bedded rooms with ensuite facilities. Both rooms are well appointed with views over the gardens courtyard and moor beyond. In addition to these rooms we also have The Byre Cottage in the courtyard which offers flexible bed and breakfast which can either be taken in the cottage delivered to your door or in the farmhouse depending on availability from the same menu. Visitors are most welcome to wander our land which include river and ancient woodland walks. br / br / br / br / When eating at Mennabroom you will be pleased to know we source all our foodstuffs wherever possible within the County of Cornwall. All is seasonal and freshly prepared. br / br / All pork and sausages are produced by us at Mennabroom. Bacon comes from the Cornish Bacon Company and all other meat is purchased from Philip Warren of Launceston. Fish is caught locally and purchased from Looe fishmongers. Dairy products come from Trewithen Dairies and eggs from our own chickens. Seasonal vegetables come from a local farm shop. Most of our preserves are made in house together with our bread. br / br / br / br / Situated close to both the A30 and A38 makes Mennabroom ideal for both touring Cornwall and Devon. In this area there is plenty to see and do the Eden Project and Lanhydrock House being close by. Both Padstow to the north and Fowey to the south are only short distance away so there is plenty to offer couples and families. Built in 1411 St. Benets Abbey is a unique building standing right at the heart of Cornwall. St Benets is at the half-way point of the Saints Way a medieval route taken by pilgrims on their way from Ireland to France which crosses from Padstow to Fowey making it an excellent two-day walk with a comfortable over-night stop at the abbey. St. Benet s Abbey is a family run business. br / br / br / br / Although offering all modern comforts the building retains the charm and character of its historical past. The seven bedrooms are well furnished in an individual style with ensuites colour TVs central heating hair dryers and tea/coffee making facilities. The abbey has ample offroad parking. The location of St Benets Abbey makes it an ideal base for the tourist being a mile from the A30 just outside Bodmin and easy to find. br / br / br / br / In the village you will find a pretty pub a Norman church post office and village shop. Padstow Tintagel (the legendary birthplace of King Arthur) Port Issac & Boscastle on the North coast and Fowey St Austell (with the port of Charlestown) Looe Polperro & Mevagissey to the south are excellent days out. We offer a choice of full English vegetarian or continental breakfast. Throughout the year we host a variety of special events such as murder mystery evenings and parties. Tredethy House is a beautiful peaceful and informally elegant English Country House set in and area of outstanding beauty. Built in Tudor times and later extended it has been the unique home of many British families and of Prince Chula of Thailand until the late sixties. A delightful and unique holiday spot today Tredethy offers privacy and the blissful peace of the countryside whatever the season and is yet at easy reach of the North and South Coast as well as the many places of interest such as the Eden Project and the divine National Trust Houses and Gardens of Cornwall. The seven acres of grounds at Tredethy are themselves a piece of history with many old trees and plants and some of the most beautiful Hydrangeas and Rhododendrons. March hosts hundreds of narcissus April is time for the breathtaking display of bluebells followed by wild garlic and blue and pink wildflowers. Autumn is a fantastic season full of colour and peace and lots of anticipation for the festive season we all look forward to every year. Situated in the heart of central Cornwall, and established for more than 24 years this family run bed and breakfast is the ideal place to stay for touring the county. We are only about 7 miles (20 minutes drive) from The Eden Project and approximately 14 miles to either coast, with Land's End around an hour away. The Lost Gardens of Heligan, another very popular attraction, is about 30 minutes drive. Bodmin town is less than three miles, and the village pub just a ten minute walk, where you can sample the locally brewed beers and choose from an excellent and varied menu. Also in the village of Lanivet is a mini market, a post office, licensed fish restaurant and a church. In the church yard there is a stone which claims to mark the centre of Cornwall. The famous Saint's Way runs through Lanivet, and the Camel Trail is only about five minutes drive. Both these are very popular with walkers, The Camel Trail also being a favourite with cyclists. Our accommodation consists of an en suite double room, an en suite twin room, and another double room with private bathroom. All rooms have courtesy trays, hair driers and clock radios. In the evenings guests are welcome to watch TV in the lounge with us if they wish. Should you visit us out of season, there is full central heating in all rooms. Prices: £28.00 to £30.00pppn. Sorry No Children. Off Road parking available. Open all year round, with the exception of the Christmas period. Minimum 2 night stay at peak times. Please Contact: Wendy Wheeler, Tremorvah Guesthouse, Rosehill, Lanivet, Bodmin, Cornwall PL30 5ES. Telephone: 01208 831379.